• November 1 – American Marines landed on Bougainville in the Solomon Islands. • November 5 – American carrier planes and heavy bombers attacked Japanese warships at Rabaul. • November 7 – A natural gas explosion in Anaconda leveled a block–long federal housing project, injuring two. • November 11 – Henry L. Myers, former U.S. Senator from Montana (1911-1923) and associate justice of the Montana Supreme Court (1927-1929), died in Billings. • November 17 – Two Great Northern “speeder” cars carrying members of a track repair crew crashed 35 miles east of Libby, with three killed and 12 injured. • November 20 – U.S. Marines landed on Tarawa Atoll and Makin Island. 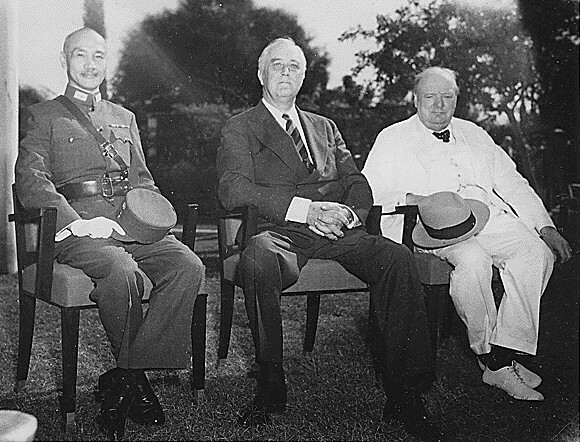 • November 22 – President Roosevelt, Winston Churchill, and Chiang Kai-shek met in Cairo. •November 23 – A fire caused $11,000 in damages at the Albemarle Apartment building in Butte. • November 25 – The Missoula Spartans defeated the Billings Broncs for the state football title. • November 28 – Churchill, Stalin, and Roosevelt met in Tehran and agreed on the planned invasion of Europe.